NASA’s MErcury Surface, Space ENvironment, GEochemistry, and Ranging (MESSENGER) spacecraft has provided the first optical images of ice and other frozen volatile materials within permanently shadowed craters near Mercury’s north pole. The images not only reveal the morphology of the frozen volatiles, but they also provide insight into when the ices were trapped and how they’ve evolved, according to an article published October 15 in the journal, Geology. Two decades ago, Earth-based radar images of Mercury revealed the polar deposits, postulated to consist of water ice. That hypothesis was later confirmed by MESSENGER through a combination of neutron spectrometry, thermal modeling, and infrared reflectometry. “But along with confirming the earlier idea, there is a lot new to be learned by seeing the deposits,” said lead author Nancy Chabot, the Instrument Scientist for MESSENGER’s Mercury Dual Imaging System (MDIS) and a planetary scientist at the Johns Hopkins University Applied Physics Laboratory in Laurel, Maryland. Beginning with MESSENGER’s first extended mission in 2012, scientists launched an imaging campaign with the broadband clear filter of MDIS’s wide-angle camera (WAC). 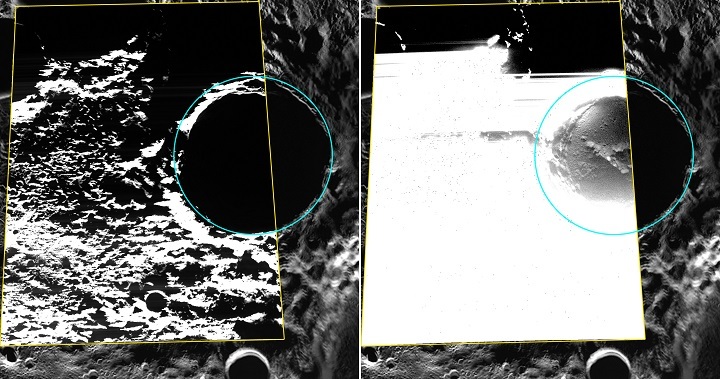 Although the polar deposits are in permanent shadow, through many refinements in the imaging, the WAC was able to obtain images of the surfaces of the deposits by leveraging very low levels of light scattered from illuminated crater walls. “It worked in spectacular fashion,” said Chabot. Kandinsky crater is located near Mercury’s north pole and shows evidence for hosting water ice. Image Credit: NASA/Johns Hopkins University Applied Physics Laboratory/Carnegie Institution of Washington.